Watching all the news lately, takes me back to a time in my life when I first became acquainted with dissent in this country on a personal basis. I had seen the disruption of the Democratic National Convention in 1968 on television while I was in high school and the protests to the Vietnam War. I remember registering for the draft and getting number 11. Had the war continued one or two more years, my life would have changed immensely. I remember guys like Jerry Rubin and Abbie Hoffmann and wondered, in a high school way, what this was all about and how it applied to my life. Fast forward to college, my room mate and I became friends with a girl who was studying Native American Affairs and invited us to spend the weekend at the Seneca Corn Planter reservation up near the New York State border. We learned a lot about how the federal government had relocated their reservation due to the construction of the Kinzua Dam and how the spartan concrete block residences had replaced their native habitat on the original reservation. I chuckled when one of the older tribesmen offered to play Native American music for us. We were excited for the show only to be treated to an hour of listening to a reel to reel tape. But the old guy was sincere in entertaining and educating us. The younger folks observed us with a wary eye and as I bought some bead work necklaces in the store, I was told that not many white people were allowed to buy things in that store. I was polite in my appreciation. That weekend opened my eyes to a situation in which I started to take great interest. When I was working in Sugarloaf, Maine after graduation, I learned that our friend Debbie was working for Ted Kennedy and was involved in the Passamaquoddy Indian Trial in Maine. I had read ” Bury my Heart at Wounded Knee” by Dee Brown and was familiar with Dennis Banks and the American Indian Movement. 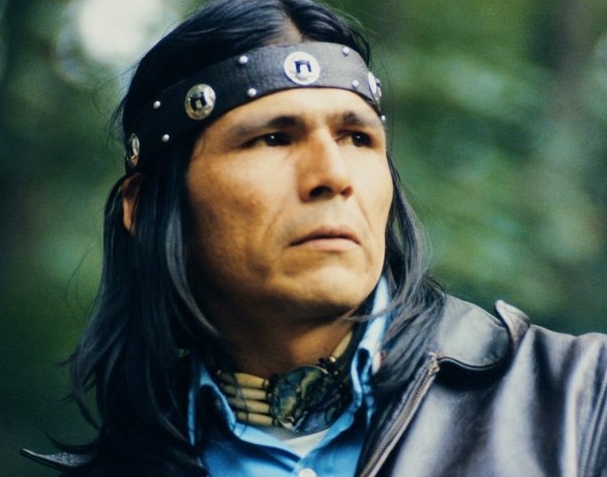 As it turned out, Dennis Banks and Russell Means were in Maine for the trial in full native attire and Debbie invited me to see the proceedings. She told me I would have to sit in the balcony with the AIM protesters and that I should say that I was a journalist. She said some of the protests had become violent and wanted to warn me, but I was excited to see the proceedings in light of my experience with the Cornplanters and my interest in history. However, I got a call in the morning from Debbie who said not to come because a couple of the AIM protesters had beaten her attorney and the trial was cancelled until further notice. Again, I was kind of wide eyed at the whole protest movement and kept in touch with Debbie on the status of the trial and whether the Passamaquoddy tribe had any rights to retake large portions of the state of Maine. 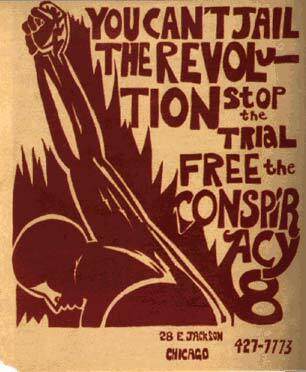 Growing up in the 60s, I became familiar with dissent and protest in this country. Being a history buff, I know that protest has been a hallmark of our free society since the origins of our country. From the Boston Tea Party organized by Samuel Adams in 1773 to the Whiskey Rebellion here in Western Pennsylvania protesting what was seen as an unfair tax on distillers in the region. Personally, I think it is healthy to have discussion, debate and discourse on subjects that affect all of us as Americans. I know that protest has historically become violent at times to promote the cause but I do have a hard time recognizing what I see as random violence like smashing windows and burning vehicles. I guess that is where I tend to draw the line- anarchy versus protest. I am still coming to terms with that. I never wanted to get political in my blog or Facebook pages and the intent here is to continue that protocol. But I know there are always two sides to every story. I have my personal beliefs, but in this day of great polarization in our country, I think it is important for all of us Americans to discuss, debate and not personalize the differences with name calling and vitriol. Thomas Jefferson once said,” Every difference of opinion is not a difference of principal.” I believe deep down that most Americans recognize that we live in a great country and are blessed in comparison to most places in the world. Our differences can be discussed with civility as we are all Americans united in continually trying to improve our country and our government. Dissent is nothing new and can be healthy as history has proven. Thanks for reading. This entry was posted in American Culture, American History, Culture, Inspiration and tagged 60's, American Indian Movement, Dennis Banks, Protest, Russell Means, Seneca Cornplanter Tribe. 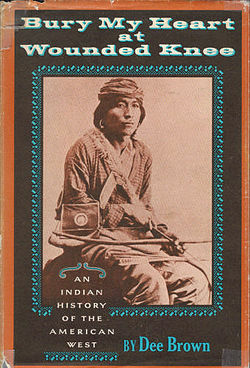 Do you know which Native Americans appear on the poster? 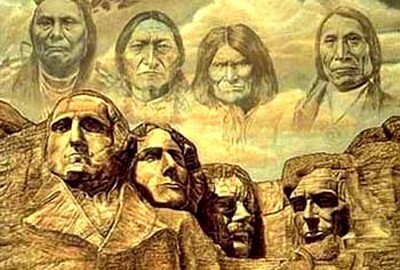 Chief Joseph, Sitting Bull, Geronimo, Chief Red Cloud. Great post, Pat, very well thought out and expressed. I might add that with many political debates there are three sides, the third side being the truth.